View More In Pacific Islands. THIS ITEM IS NOW AN OUT OF PRINT VERY HARD TO FIND ITEM that features the Makaha Sons of Ni'ihau. 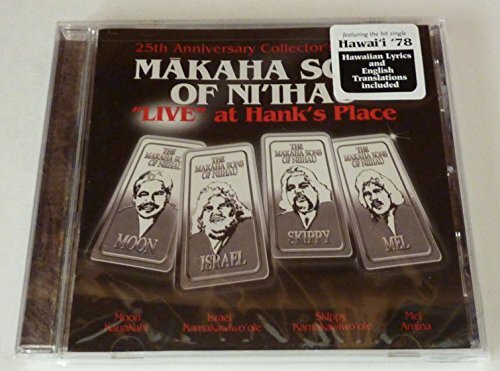 This CD was released to celebrate the 25th Anniversay of The Makaha Sons of Ni'ihau's first recording made live at Hank's. Members of the group were: Moon Kaukahi, Israel (Iz) Kamakawiwo'ole, Skippy Kamakawiwo'ole, and Mel Amina. Included is a 16 page booklet with Hawaiian lyrics and English translations. This CD is a must have for any collection of Hawaiian music! If you have any questions about this product by Quiet Storm Records, contact us by completing and submitting the form below. If you are looking for a specif part number, please include it with your message.